Yes, you got it right! From today, Gleni will be by your side even on the road! Whether it’s a short stay or a longer holiday, our bags will satisfy your every need for space and functionality, giving you an elegant and refined look even when you’re at the airport for a business trip or when you’re leaving with your friends for a holiday of total relaxation. The Gleni travel line consists of several different versions of holdall with different dimensions and structures but all characterized by a same classic and sober line, provided with different internal and external pockets (depending on the model you choose), double handle and detachable shoulder strap. The internal compartments are very spacious and covered in fabric or treated and washable leather. We decided to open our travel collection with holdalls instead of trolleys because, in our opinion, the holdall never goes out of fashion and despite the passing of the years, fashions and trends, continues to collect again very successful and gives charm and prestige to the one who brings it. 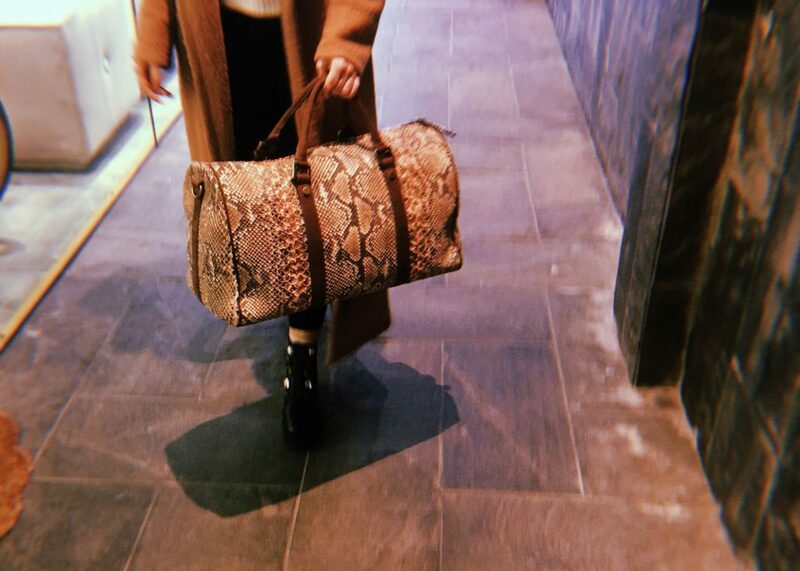 Combined with python leather, the holdall will allow you to stand out from the rest of the people, giving you luxury and style. However, for all of you who love practicality and comfort as well as elegance and beauty, do not despair! We are also planning a line of trolley of various sizes, to be realized in exotic leather, as in the Gleni style. 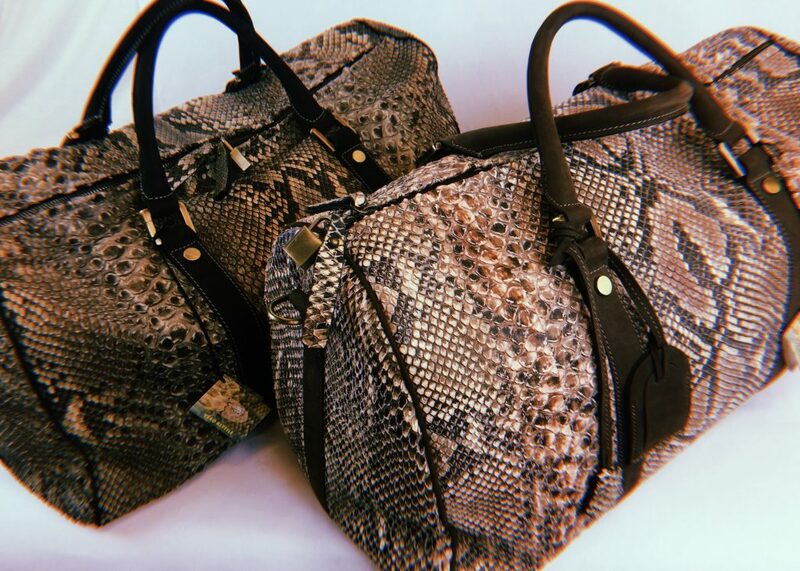 For this capsule collection, we chose genuine python leather and sober colours that perfectly go with each look and style, like roccia grey, roccia brown, black (for this item we opted for a back cut giant python, with a rather large central scale tat gives a great visual effect) or the classic graded green undergrowth. Obviously, if you like the model but not the colour (or the type of leather chosen) of these holdalls, we can always produce your personalised holdall! How should you move to have your personalized travel bag (holdalls or trolleys)? It’s very simple! Visit the new section of our Gleni Boutique LABORATORY, where you will find all the necessary info and the product schedule of our items (travel bags included), that you can create all by yourselves, by choosing the leather, the colour and the finishing. When your creation is complete, you can go on by ordering it to us. Our staff, if you want, will help you in the creation of the item that can better answer to your necessities and personal tastes, in order to appear impeccable also when you are on a trip! Gleni, the luxury of being yourselves with style!